Child care is one of the largest household expenses families face today. 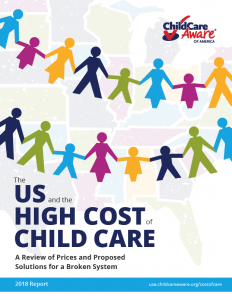 A new report from Child Care Aware examines the cost and affordability of child care from state to state, showing that quality child care still remains unaffordable for most families across the country. The new report finds that in 2017, the cost of center-based infant care exceeded one year’s tuition and fees at a four-year public college in 28 states and the District of Columbia. Similarly, the cost of center-based care for 2 children exceeded housing costs for homeowners with a mortgage in 35 states and DC and the cost of food and transportation combined in all regions of the country. Access is not enough, quality matters too. The report details why quality early learning and care is vital for children, particularly those from low-income families, to achieve success in school and throughout their lives. Research shows both short- and long-term benefits for children who attend high-quality programs, including lasting gains in both IQ and social-emotional skills. These gains prepare individuals to earn higher wages as adults, live healthier lives, avoid incarceration, raise stronger families, and contribute to society. Unfortunately, only 18% of voters in America say they have affordable, high-quality child care programs in their area, according to FFYF’s most recent national poll. Inequitable access to quality child care also affects families and employers. Access to affordable and reliable child care is critical for working families, offering parents better job stability and overall economic security. Without access to early learning and care, parents tend to miss work, lowering household incomes and potentially leading to job loss. Child Care Aware reports that that over a six-month period, 45 percent of parents are absent from work at least once due to child care breakdowns, such as provider being closed or a child being sick. Additionally an estimated $28.9 billion in wages is lost annually by working families who do not have access to affordable child care and paid family and medical leave. Supporting families with the cost of quality child care will result in a more efficient and productive American workforce in both the short- and long term. Over the course of the past several years, Congress has generated a supportive track record on early learning. Members on both sides of the aisle have worked together to significantly increase funding, while also enacting reforms to existing early childhood programs that elevate quality and leverage state and local leadership. While no one program or solution is a silver bullet, investing in high-quality early childhood education is a solution that creates upward mobility through opportunity. FFYF strongly supports Congress’ continued investment in, and partnership with states to support local providers to address the needs of children from low-income families. Read the full report from Child Care Aware here. Check out Child Care Aware’s Cost of Care map which allows users to search cost and affordability of child care across states.